How Many Krispy Kremes Could You Cram? Nothing sweeter in the world than pulling in the Krispy Kreme parking lot and seeing the "Hot" sign lit up. My sister treated me out to a weekend in civilization without the kids. The joy - dinner on the waterfront, shopping in Pittsburgh, snacks at Sheetz, and hot Krispy Kremes. All you can eat for $1.99. I feel certain that I could very well eat a dozen. That's a bargain for that price. How many do you think you could eat? *As a side note, that would be a dozen, hot, glazed doughnuts. People I work with were skeptical of my claims that I could probably eat a dozen. And I replied that when they are hot, they melt in your mouth. Then, because the closest Krispy Kreme to us is a two-hour drive, someone said they had never had a hot Krispy Kreme doughnut. Did you hear me gasp? Our next field trip will be to a Krispy Kreme. I have these cool neighbors that grow organic produce and wildflowers. I would like to take you on a visit, but I haven't got up the nerve to go over and ask to take pictures. One day....I promise. Every Saturday, you can find these neighbors at our local Farmer's Market, which I would like to take you on a visit to but haven't for the same reason above. Anyway, Farmer Brown and these people are good farm neighbors, borrowing equipment, assisting when livestock gets out - just general farm stuff. Sometimes on the way home from the farmer's market, they will drop off stuff they didn't sell which isn't often because they have good stuff and sell out. This week they dropped off their organic strawberries. They were lovely. We stuffed ourselves full of them. We had so many left though that were starting to get mushy, so I tried this recipe with them. It reminded my of the Jell-o poke cake my momma makes at Christmas. Do you see the picture of the cake? Neither do I. I didn't have enough powdered sugar to make the frosting, and a big rat got into the cake. A big rat that looked exactly like Farmer Brown. Preheat oven to 350 degrees F. Lightly grease 2 (9-inch) round cake pans. (I used a 9 x 13 pan - bake for about 35 minutes.) In a large bowl, combine cake mix and jell-o. Add pureed strawberries, eggs, oil, and water; beat at medium speed with mixer until smooth. Pour into prepared pans, and bake for 20 minutes, or until a wooden pick inserted in the center comes out clean. Let cool in pans for 10 minutes. Remove from pans, and cool completely on wire racks. In a large bowl, beat butter and cream cheese until creamy. Beat in 1/4 cup of the strawberry puree and the vanilla extract. Gradually add confectioners' sugar, beating until smooth. Spread frosting in between layers and on top and sides of cake. Garnish with sliced fresh strawberries. The school year is winding down. I feel as though my job is just tap dancing and singing to entertain the students until the last day. Even though I don't have as much work to bring home, I come through the door exhausted. Coming home never felt so good. To be healthier, I'm trying to eat less meat. (Please don't let Farmer Brown know that I'm cutting back on beef consumption.) This is not something that bothers me. I can take meat or leave it. But enough about real hamburgers because we are talking healthy here. To replace my passion for hamburgers, I have turned to veggie burgers. If they make a veggie burger, I have bought it. I will not say that I have eaten them, because some are inedible. Right now, my favorite is the Spicy Black Bean Burger by Morningstar Farms. This is the least one to taste like a burger. But it is spicy and full of black beans. (I'm not sure what else you need to know - it's just good.) It is fabulous on Arnold's Sandwich Thins, toasted, topped with a little salsa, pickles, and lettuce. I'm also a little partial to the Morningstar Farms Original Griller. This one comes close to a burger. Just don't look at when you eat it. These do really well cooked in a pan on the stove. Four minutes - it is ready to go. 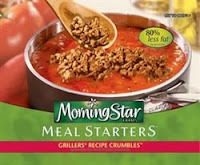 One more plug for Morningstar Farms. Their Grillers Recipe Crumbles aren't too bad. I mixed some regular ground beef with some of these in chili and Farmer Brown, the big beef man, didn't notice. Okay, this one isn't a burger either. 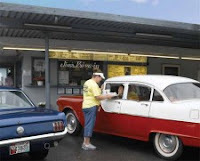 The Boca Chick'n Patties, the Originals are good. Once again, don't look at it while you eat it and you will think that it is a deep-fried chicken patty. They do need to be fixed in the oven or on the stove. I don't recommend the microwave for any of these. That makes them taste a little smooshy. Amy. Amy. Amy. I have tried to like you. Your company is remarkable, selling organic, natural foods. I am sure that there are edible products that you produce, but I've been burned so badly on your $5 4-pack of burgers that I've been reluctant to buy anything else. Currently, I have the Texas Burger package in my freezer. I have eaten one and a half. I ate the first one because I was going to choke it down because it was too late to make something else. The half was this weekend because I thought maybe a fresh tomato and good bread would make a difference. It didn't. If you love whole foods, you'll love the Amy burgers because there are large grains of oats, bean, and barley (actually, not really sure what is in there - I try not to think of it too much). Some are crunchy. Some are so crunchy, you will wonder if maybe it is a contaminated batch full of real bugs. Nothing replaces a real burger, but in the meantime, there are some good choices available out there. Maybe what we all need is some "spicy mustard or something" on all our burgers. I have been slowly working on losing weight. I am not doing any drastic program, just taking what I've learned from all of them and using what works for me. I've been uping my exercise each week - which was easy, because I wasn't doing any. I've still been enjoying foods I love just in smaller portions. It's worked - I've lost twenty pounds in four months. But don't wave the banner yet, because, have you seen this? What happened? And it's not just Kirstie were talking about. There sits Oprah with her poundage packed back on. These ladies have personal trainers, personal chefs, personal gyms. Not to mention that one had the backing of a weight loss company. They have all of this and THEY STILL GAINED IT BACK. These were two honest women I could relate to in all their food battles. I was cheering them on. They were exciting, they were encouraging, they were doing it all in front of everyone. Didn't you get thrilled for them? Didn't you watch Ms. Alley strut across the stage in her bathing suit for all to see? Didn't you buy the issue of O Magazine with the skinny Oprah on the front? So, I'm scared. Scared this will happen to me. For today though, I am going to concentrate on the success of these twenty pounds. I'm going to focus on the next goal. Someone has to be successful in this. Years ago when people preserved their own food, the early spring months would be the time that the supply of fresh food would be low and everyone would be tired of eating dried beans again. Here in West Virginia, one of the first signs that spring is on its way is the appearance of these little green shoots in the woods. These are ramps or wild onions. Many people feel strongly that these little foul weeds act as a spring tonic to cure whatever has been ailing you the last few months of winter. My theory is that if you hadn't been eating anything green for months and you finally shocked your body with some, you would have to feel better. You can find them growing wild in small hollers up in the mountains. This patch is a closely guarded secret near our house. I would tell you where it is, but even I haven't been allowed to visit. Farmer Brown's Uncle took these pictures for me - Thanks, Delmas! They look like onions, taste better, but smell like old sweaty-socks. Their smell is pungent. Beware that if you eat them, the smell will reek out of your pores for at least a day. You don't even want to know what it does to your breath. I put some in the fridge in an airtight container and the taste seeped into everything, including the milk. I fully intended to use some ramps in some new, interesting recipes involving a pizza and one involving Gruyere cheese, but I misplaced them. Then the smell of them in the fridge was so revolting, that I just couldn't imagine what cooking them would make my kitchen smell like. Most people like to fry ramps in bacon grease and eat them with eggs. My grandmother likes them raw. Throughout West Virginia in April and early May you can find Ramp Dinners at schools and Ruritan Clubs. The most well-known dinner is the Feast of the Ramson in Richwood, WV. For over 71 years, people have been flocking to my small high school town to eat these "little stinkers". You can also now buy ramp products. This place also sells ramp seeds so you can plant your own crop for next spring. So if you've been feeling poorly this winter, try and scrounge you up some ramps. I don't know if they would cure Swine Flu, but I'm pretty sure it will keep people away from you for several days.